Even if I don't believe in easy and generic definitions, I could describe my political views as libertarian. I am usualy standing for liberty and freedom, economical and social. I m sympathising the west democratic culture and I would like to see it succeed. I used to be very political active once. It was when I was younger and I thouht that a political theory could change the world. Growing older I realize that ideologies alone cannot improve people's lives. In any ideology or political theory there are pros and cons. And at the end of the day, even if quite all political ideologies are supose to be there to help people and human societies, none can make it without the right people. By people I mean leaders and society. A leader alone cannot make anything good if his people don't want and/or don't know how to face progress. And societies need leader to be the symbol of their will and their hopes. I think that any mature person could easily accept that the above are common sense. 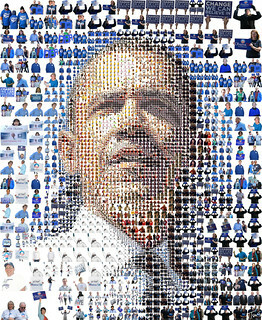 So, it makes common sense to me to support Barack Obama to be the next president of the United States. He might not be the ideal candidate for a libertarian, but he seems the right guy to give a new perspective to the western democratic system. 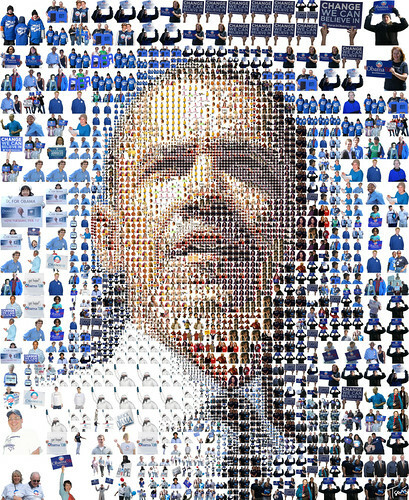 A mosaic portrait of Barack Obama made out of people who support him. A mosaic of people of any race, religion, nationality and culture. This image is also licenced under the Creative Commons scheme. You can download it, print it, use it in your own designs, but you have to credit me and you re not allowed to use it in any commercial work. I would like to thank my friend and partner at Tsevis Visual Design, Aris Sakkas, who helped me with the preparation of the tiles. I also like to thank my wife Eva for her suggestions and her continuous support. Last but not least I am thanking all the Obama supporters who contributed these beautiful photos.